Well, I did it..my on-line friend, Stacie, encouraged me to set up a blog. Please be patient, as I haven't a clue as to what I'm doing! 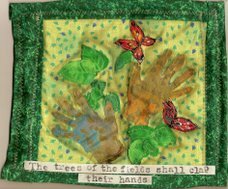 I chose my blog name, Trees of the Fields, from one of my favorite Scriptures, Isaiah 55:12. I just love the thought of the mountains bursting into song and the trees clapping their hands. In fact, I used this scripture for one of my journal quilts thru the FabricInAlteredArt group...a wonderful group! Awesome Jo- You go girl! Sending lotsa love your way- so happy you've done it- welcome to the world of blogging. Great start Jo! Now, I need to get busy and start one. I love reading my art friends blogs so much. Maybe I have something interesting to say??? Yeah!! Welome to blogland ... hee hee Thank you for adding me to your blog list, Jo ... I added you to mine too! I have been mulling this over in my mind for the last few weeks. You are an inspiration to me! My biggest problem right now is this computer not uploading. I don't know if it'll email my pics or not. Jo...your blog is wonderful and so is your art. Thank you for letting me be part of your world!